Join our team for the Paris2Nice charity cycle and make 2017 a year to remember. We are recruiting a team of supporters to participate in the 2017 Paris2Nice charity cycle. Starting in Paris and finishing in Nice, the 700km journey takes place in September and it promises to be the experience of a lifetime. All levels of cyclists are welcome and there are also training sessions in Dublin to help guide you in your training. For the more experiences cyclists, there is also the added challenge of climbing the notorious Mont Ventoux – a regular fixture on the Tour De France. All participants to set a minimum fundraising target of €3,000 and we will happily support your fundraising every step of the way. You can also choose what area of the hospital you would like to support. If you would like to hear more about the 2017 Paris2Nice Cycle Challenge, please contact Jamie on 01 4103936 or email jamie@supportstjames.ie. 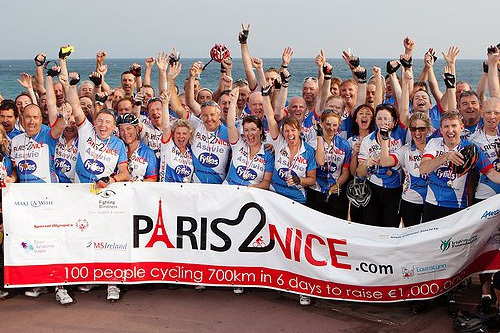 You can also visit www.paris2Nice.com for more information on how to sign up.